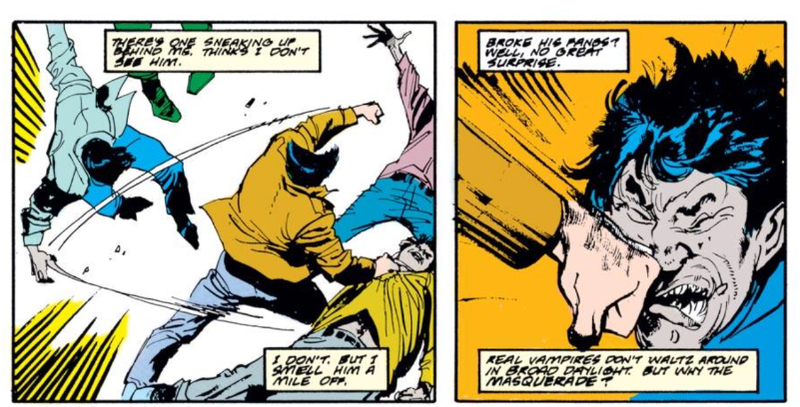 In the courtroom, Wolverine helps fight off the Followers of Ba'al, whom he quickly realizes aren't actually vampires. When Jessica arrives to court late, she's drawn into the fray, leaping onto the back of Burt's horse as he tries to escape. Two of the Followers waiting outside in a car see him leave, and take off after him. 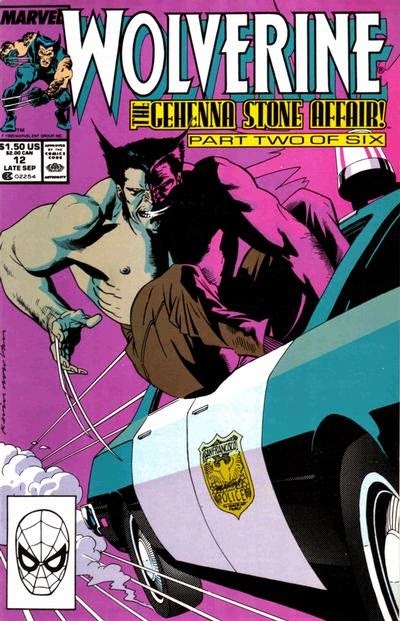 As the police arrive, Wolverine and Archie escape the courtroom, stealing a cop car to follow Burt while another group of Followers steals their own car and pursues them. Elsewhere, the Followers' leader waits for the ones he seeks to be driven to him. In San Fransisco, a four way chase erupts between Burt & Jessica, Wolverine & Archie, and the Followers of Ba'al. 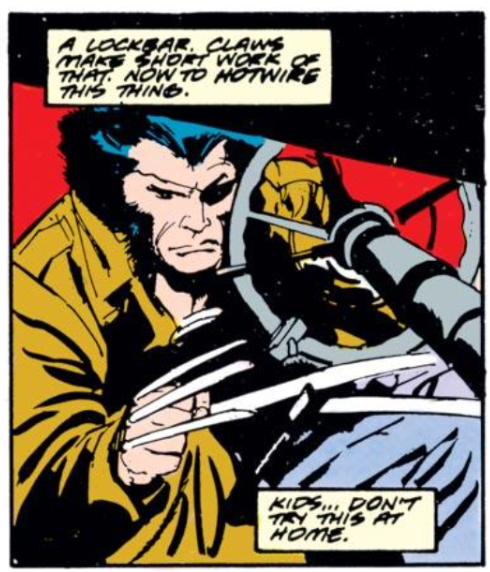 As Burt explains to Jessica he stole the stone fragment from the museum to prevent the Followers from getting it, Wolverine is able to surreptitiously use his claws to take out one of the Followers' cars, and is then able to force the other car to crash into a trolley. 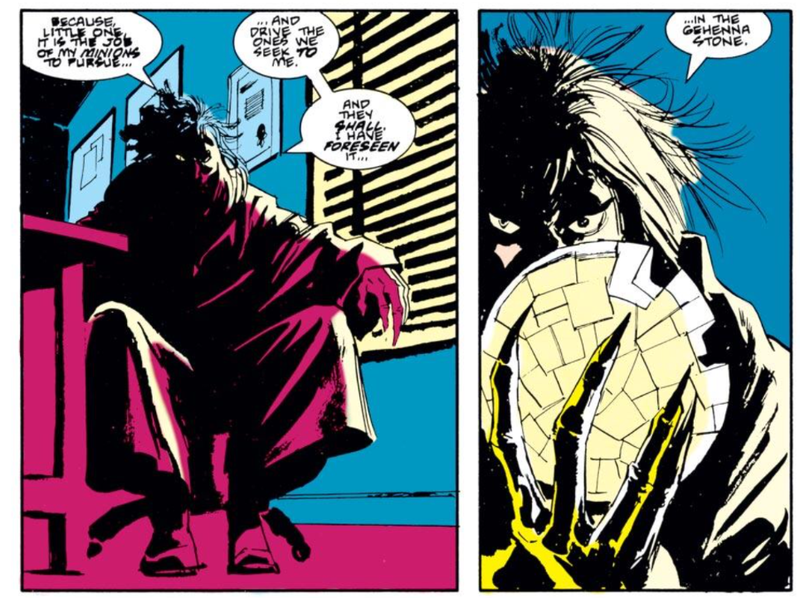 Catching up to Burt and Jessica, Wolverine announces they need to go back to Madripoor, because San Fransisco is about to get pretty hot in the wake of their fight with the Followers. Archie is reluctant to bring his brother back to Madripoor, but ultimately decides whether he's along or not, things can't get any worse. The leader of the followers of Ba'al appears for the first time, though we don't learn his name and he remains hidden in shadows. It's established this issue that the followers of Ba'al are not actually vampires, as they're out in the daylight (ah, the pre-Twilight days) and have fake fangs. It's also established that the Gehenna Stone is actually one stone comprised of several smaller fragments, and its some of these missing fragments the Followers of Ba'al are after, one of which Burt took from the museum. Between last issue and this one, that fragment now looks more like a fragment and less like a smaller version of the stone. I Love the 80sWolverine hot wires a care, advising kids not to try it at home. The title of this issue is done up like the title of an Indiana Jones movie, and the title itself is a reference to the film The Streets of San Fransisco. 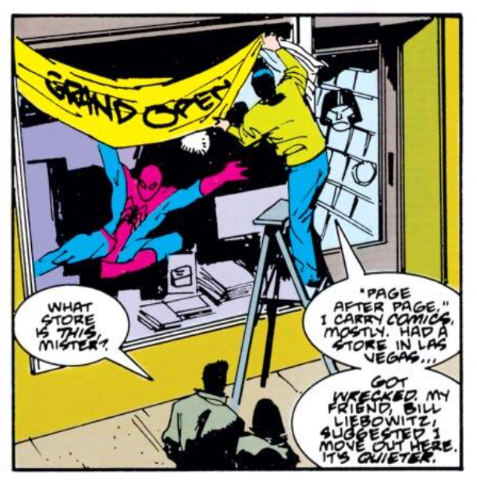 During the car chase, a vehicle crashes into the comic book shop Page after Page, a Las Vegas shop for which which Peter David apparently has some affinity. Presumably, the damage mentioned in this issue occurred in a Peter David-penned Hulk issue. Two issues into a six part story, and this already feels padded. This issue is essentially one long car/horse chase scene (given the San Fran setting and other film references, a nod to Bullit, perhaps?) that does the bare minimum in advancing the plot (the vampires are fakes, we meet their leader but he's shadowy and unnamed, and we learn there are fragments of the larger Gehenna Stone out there). Handing over an entire chapter of a story to an action sequence isn't a terrible idea, especially if the action is well rendered. This, unfortunately, is not, as it's difficult to get a handle on how the various players in their various vehicles (cars or horse) relate in space to one another throughout the chase. Furthermore, the rigid panel layout and lack of backgrounds that have been a staple of Buscema's work on this series become particularly problematic here. The panel layout makes the action feel cramped (and contributors to the problem of how everyone relates to one another throughout the sequence) while the lack of backgrounds (most panels are just filled in with a solid color) does nothing to establish a tone, or even time-of-day (is it morning? afternoon? Whatever time it is when the sky is pale pink? The text makes it clear it's daytime, but the art never shows that). The end result is a lackluster issue-long action sequence that just feels like filler. And we're only on chapter two. Next week, Uncanny X-Men #249, New Mutants #80 and X-Factor #45. "Presumably, the damage mentioned in this issue occurred in a Peter David-penned Hulk issue. " I dug through and compared the writer names and saw that Peter David had done them both ... and it was the first time I had *ever* paid attention to the writer credit on a comic. It would not be the last. These Wolverine reviews are going to start being so nostalgic for me, because this was the only X-title I was consistently buying off the rack on the very week it would come out. From issue 8 all the way up to issue 65, I never missed one. Your reaction to this issue and the last match mine. The lack of action was very frustrating to ten-year-old me, even though the wait was only two weeks between issues. I also noticed and was confused by the fragment changing shape between issues; and was vaguely confused by the logistics of the car chase this issue. Luckily, things picked up: The next two issues of the saga are good ... Part 4 is particularly Fanboy-pleasing, for reasons that you are probably already aware of, if you've seen the cover. Really nice Kevin Nowlan cover. I didn't know he did these. #11's wasn't great, but this one is classic Nowlan, as he uses shades of blue and pink/purple that most colorists couldn't (or never bothered to) create using the old Dr. Martin's guides, although I wish there were a bit more contrast between the background and the siren lighting. Just to add to the Page by Page reference: Bill Liebowitz, mentioned, was the owner of LA's renowned Golden Apple Comics. You're dead on about the lack of establishing an orientation for the players in the chase scene relative to one another.